Divorce is no laughing matter and I am not making light of it to tell you my husband and I sometimes say that financially, we couldn’t afford to divorce even if we wanted to (we don’t!). Silly jokes aside, the fact remains that as well as the emotional stress of separation and divorce, there is also a considerable financial cost and worry over future financial security. Real Money Advice for Divorce is the first Australian book to help those going through separation to handle the financial, legal and emotional hurdles of divorce. Designed to guide those divorcing through a step-by-step process, each section includes short term and long term financial advice, tips about dealing with emotional pressures and tools such as budget plans, sample statements of net worth and useful contacts. The book also includes a comprehensive guide to the legal issues divorcing couples might face in simple, straightforward terms, which is particularly useful as the legal aspect of separating can be incredibly daunting. 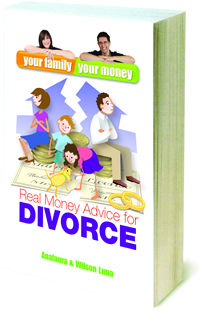 Real Money Advice for Divorce is the third book by authors Analaura and Wilson Luna in the Your Family Your Money series and was written because the Lunas saw that while plenty of books addressed the emotional and psychological aspects of divorce, there was nothing relevant for Australians outlining the financial side of separation. To that end, there are lots of practical suggestions and checklists for getting your personal affairs in order – from sorting out insurance beneficiaries through to dividing the CD collection. Helpfully, the book also covers ‘non-traditional’ separations where the couple continues to live in the same house – a situation I suspect is increasing given rising property and living costs. The Lunas stress an important point – when our emotions are running high, sensible and clear decisions can be difficult to make. This book is just that – sensible, clear and a good reference for anyone facing the turmoil of divorce. Real Money Advice for Divorce is $29.99 and is available from bookstores or online at Your Family, Your Money.